From one of the prominent Chicano poets writing today comes a collection of poems to take your breath away. With dazzling speed and energy, Juan Felipe Herrera sends readers rocketing through verbal space in a celebration of the rhythms and textures of words that will make you want to shout, dance, and read out loud. Like a wild ride in a fast car, Border-Crosser with a Lamborghini Dream moves at breakneck speed, a post-Lorca journey across the new millennium terrain. Words careen through space and time, through blighted urban landscapes, past banjos and bees, past AIDS faces and mad friars, past severed heads and steel-toed border-crosser boots. To the rhythm of “The Blue Eyed Mambo that Unveils My Lover’s Belly”and the sounds of the Last Mayan Acid rock band, Herrera races through the hallucinations of a nation that remains just outside of paradise. 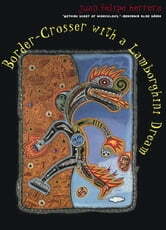 With dazzling poems that roar from the darkest corners of our minds toward an ecstatic celebration of the lushness of language, Border-Crosser with a Lamborghini Dream is a celebration of a world that is both sacred and cruel, a world of “Poesy Chicano style undone wild” by one of the most daring poets of our time.